This is the perfect stew for a chilly spring evening. We are finally harvesting the first of our spring greens at the farm and this recipe really celebrates the season. This is a great meal to dish up on a cool and crisp night and thanks to a hefty pinch of grated ginger this has a little punch that’ll warm you right up. 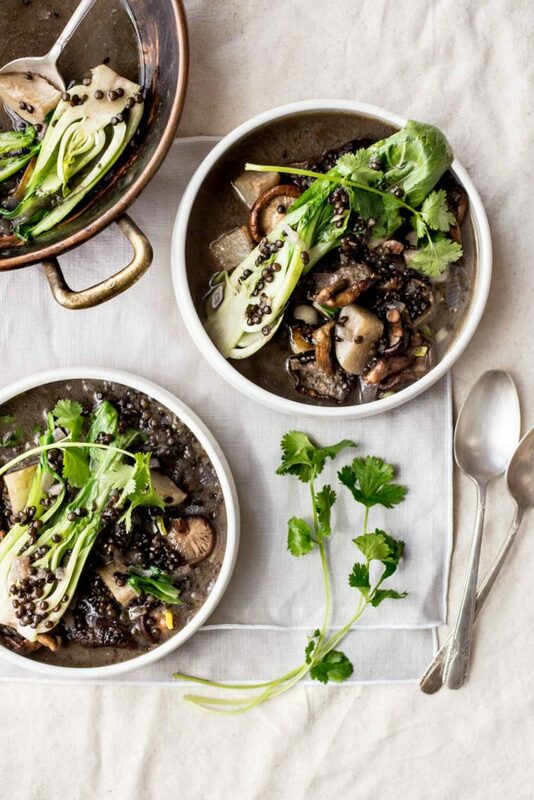 The combination of sweet turnips, earthy mushrooms, coconut milk and bok choy really come together in this healthy meal. The leftovers are great (though the bok choy gets a little mushy) and taste wonderful spooned over a piece of thick toasted sourdough bread with a fried egg on top. Seriously, if you have leftovers try that! The soup thickens up overnight and taste great for breakfast! I hope you all enjoy this simple spring meal as much as we do. Preheat the oven to 375F. Toss the turnips with 2 tablespoons olive oil and place on a rimmed baking sheet. Roast in the oven until tender and lightly browned, about 18-22 minutes. Toss halfway through cooking. Heat 1 tablespoon olive oil in a large heavy bottom pot over medium high heat. Add the onion and sauté until soft and translucent. Add the garlic and ginger and cook, stirring occasionally, for about 2 minutes. Remove the mixture from the heat and tip it into a bowl. Add the remaining 1 tablespoon olive oil to the pot and add the mushrooms, cook, without stirring for 1 minute. Give a good stir and then continue to cook until the mushrooms are nicely browned on all sides, about 3-5 minutes. Remove the mushrooms from the pan and add them to the bowl with the onion mixture. Add the lentils, red pepper flakes, coconut milk and broth to the pan. Bring to a simmer, cook until the lentils are tender, about 18-20 minutes. Add the bok choy stems, mushroom and onion mixture and increase the heat to high and cook for another 5 minutes or until the mixture has thickened. Add the bok choy leaves and roasted turnips. Keep on low heat for about 10 minutes so all the flavors have a chance to meld. Divide the stew between bowls and top with plenty of minced cilantro and salt and pepper to taste. This looks fabulous! I love nothing more on a chilly night than a warm bowl of healthy soup. Looks delicious. This may be a silly question, however, the title indicates curry but there is no curry referenced in the ingredient list? Regardless, I’m looking forward to preparing this soon. There’s no premade curry in this dish. It’s the combination of the ginger and spices that gives this a kick! I hope that’s helpful!